Are you just plain tired of using the same old "tried and true" recipes? I recently found a product that will set your tastebuds on fire with happiness. (Well, not on fire unless you use the "hot and spicy" blend.) So, what is this magical creation that will spice up your kitchen creations? Amelia's Spicing Pecans! Yes, pecans! 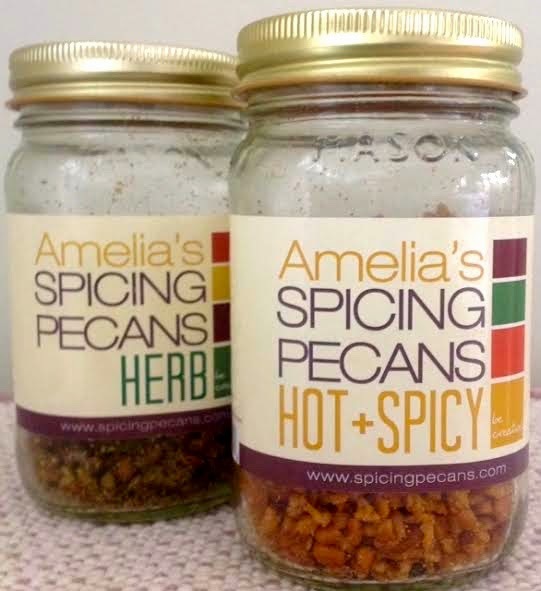 To quote the now defunct website, "Amelia's Spicing Pecans are made from select roasted chopped pecans, specially seasoned, then used as spicing ingredients to add rich flavors to your favorite dishes." You can now find information about these wonderful pecans on Facebook by clicking Amelias-Spicing-Pecans. I took Amelia's "Be Creative" challenge and did indeed find that Amelia's kicked up my old boring recipes to a higher notch. Why should one use these delectable spiced pecans in recipes instead of just plain pecans? Because Amelia's is made with only the finest all natural ingredients, specifically chosen by Amelia's creator. He oversees the roasting and the flavoring of this Alabama-made product. There were four entirely different flavors to choose from: Herb, Hot & Spicy, Cinnamon and Coffee. Remember, these Spicing Pecans are not just nuts that a cook might use to add texture to a recipe, they are finely chopped, seasoned and roasted Southern pecans that add character and depth to the food you eat. The first recipe I decided to "renew" was one that really needed spicing up. 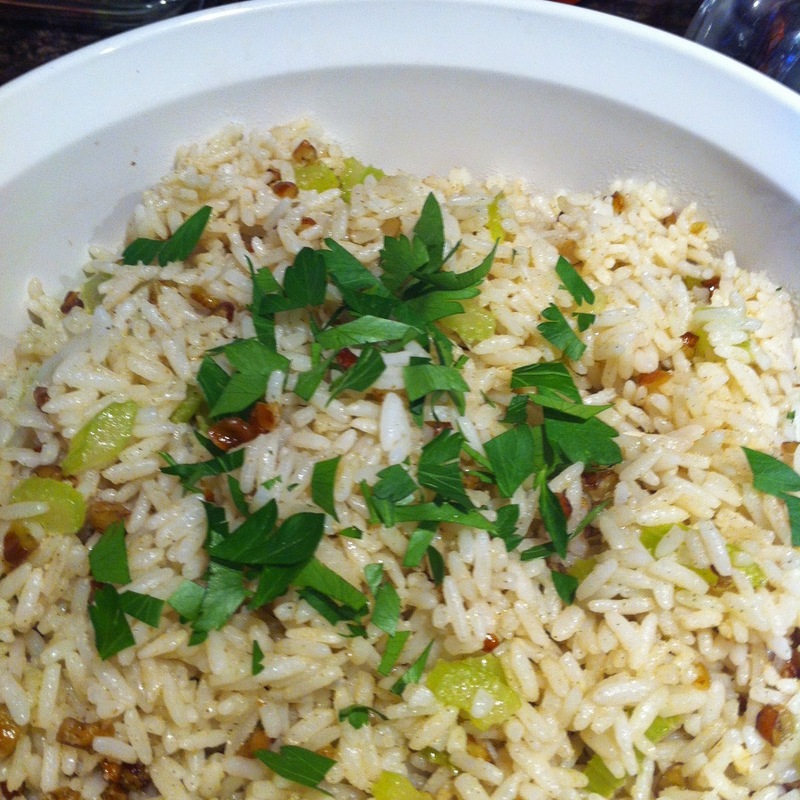 My original "Pecan Rice" recipe came from a vintage church cookbook. I had planned on making this traditional rice side dish for a family holiday dinner and I wanted it to be very special. I chose to use the herb flavored pecans because that just seemed to "fit" with the menu. So excited by the raves from my family about the pecan rice, I began to think of even more ways to use Amelia's Spicing Pecans. The obvious choice is to use the herb flavored nuts in a salad. Yes, I will tell you that the pecans worked very well in mine. It is so much fun to spice up one's culinary life. It occurred to me that the "Hot and Spicy" Amelia's would be good on a salad, too. I went to my local Whole Foods, bought that flavor to add to my growing collection of Amelia's. I was not disappointed in the results of the addition of the subtle hotness of those exquisitely seasoned, roasted pecans to a salad. I even spiced up a simple appetizer of pimento cheese on a cracker by sprinkling the Hot & Spicy Spicing Pecans on top. The Coffee flavor was amazing with the pimento cheese, too, believe it or not. Then, I had another light bulb moment! These hot and spicy pecans would be great on a pork tenderloin roast. Adapting a recipe for Pecan-Crusted Pork Tenderloin, I used the Amelia's hot and spicy blend with perfect results. My only regret is that I did not crush the pecans into even smaller pieces. They might have not fallen off the tenderloin as easily as they did. Live, cook and learn, I say! Now I am really cooking and being creative! What can I use these spicing pecans on next? Why not take Cooking Light Magazine's Texas Sheet Cake to a higher level? Yes, that is what I will do. Anyway, I need a spectacular dessert to take to a party and this is the perfect chance to show off my baking creativity. First I made the cake just like the recipe on the Recipe.com website and poured the cake batter into my new KitchenAid 10"x15"x1" Jelly Roll Pan . Yes, a jelly roll pan is a must for a Texas sheet cake! Next I sprinkled 2 cups of Amelia's coffee blend pecans on the batter and gently pressed them down with a fork. This will keep the pecans pieces from burning--they are already roasted, you see. Amelia's Coffee Spicing Pecans on top of the uncooked cake batter. After the cake baked for 22 minutes, a toothpick inserted in the center came out clean signaling that the cake was done. Now for the best part: pouring the boiled icing over the warm cake and gently covering the top with more of the coffee flavored roasted pecans. The aroma of the coffee and chocolate was irresistible. The end result was a delightfully good and moist Texas Sheet Cake. I took it to the party and not a crumb of it remained at the end of the night. How else can one use Spicing Pecans? Use your imagination and feel free to try anything! 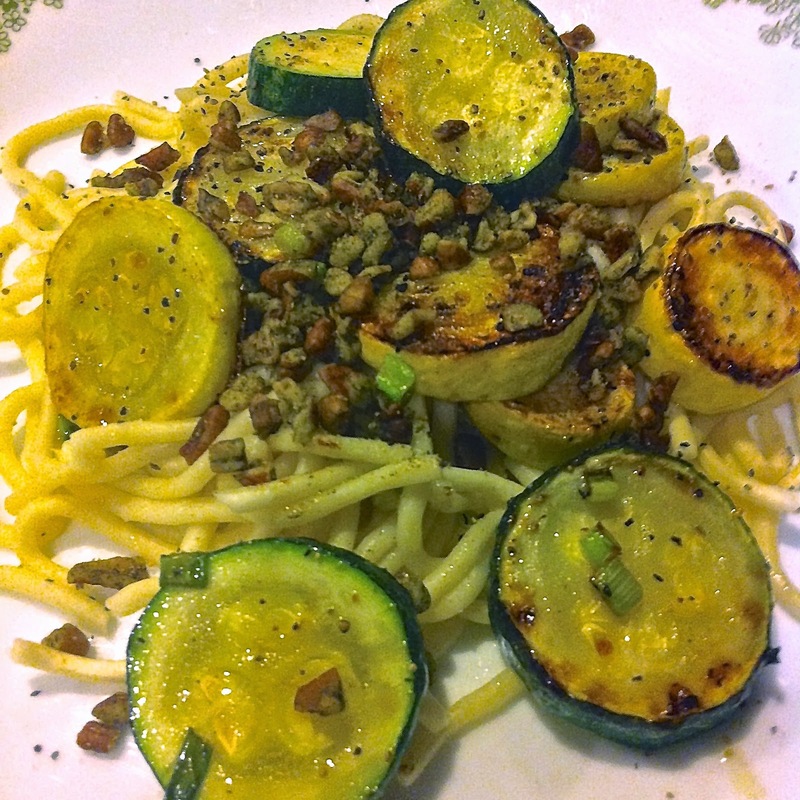 I created a Sautéed Zucchini and Squash Pasta dish for dinner one evening with amazing results. A friend suggested that I could have added a cheese like a parmesan to this dish, too. 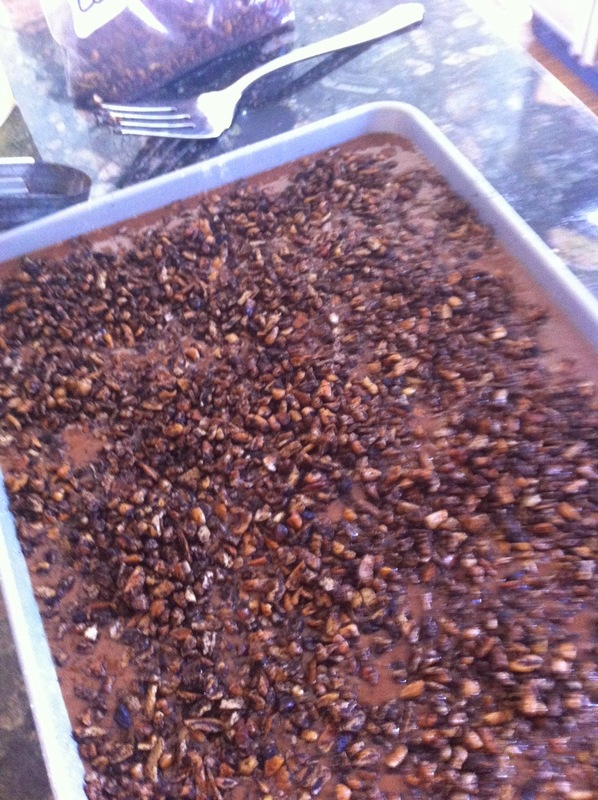 The pecan pieces you see in the photo below are the Herb Spicing Pecans. The addition dressed this dish up and add a satisfying crunch. It was incredible how the sweet flavor of the roasted pecan pieces turned this dish into a culinary event inside my mouth! Sautéed vegetables and Herb Flavored Amelia's over pasta. You can also put these nuts on leftovers! Zoe's Chicken Salad and roasted veggies dressed up with pecans by Amelia! I am sure you are wondering where you can get your own jar of these inspiring spicing pecans. Just click Amelia's-Spicing-Pecans- and call the phone # listed. When Birmingham Alabama's Pepper Place Saturday Market begins in the springtime, you might find that Amelia's in a booth with samples to try. If you are just plain impatient (or are not in Alabama or near a southeastern Whole Foods), you can contact the creator of this unique and versatile product that you MUST have in your kitchen, by emailing spicingpecans@gmail.com. Tell Mike that Mickie sent you. Disclaimer: I do not receive any compensation for sales of Amelia's Spicing Pecans. I purchased the Herb and Hot and Spicy Spicing Pecans you see int he photos on this page at Whole Foods and Organic Harvest Market in Birmingham, Alabama. The creator of Amelia's did graciously give me the Coffee Flavored Spicing Pecans to try in the Texas Sheet Cake recipe. Wow! These spiced pecans look great. I love trying out new things, especially from a creator that designed them himself. I will remember to the Mike that Mickie sent me when I order these. Great idea. Please do visit the website. There are lots of ways to "Be Creative!" in the kitchen. What a fabulous review and awesome recommendation! My mother, who is no doubt reading this right now, would love the idea of adding the coffee spicing pecans to the cake and my husband would want to add the hot and spicy pecans to everything. I don't have to be a "seer" to know that a trip to Whole Foods is in my near future. This is the yummiest looking recipe/food review I've read in some time. It was terrific taking a stroll through your kitchen and seeing from your pictures how tasty everything turned out with these Amelia's spicing pecans. Living here in Georgia, pecans are definitely a favorite food (in fact, they might even be considered a food group all by themselves here...lol), so it will be fun trying the various 'flavors' of these pecans. Yes, in the South we have our own food groups. Pecans is definitely one of them, but don't forget Velveeta. OMG. 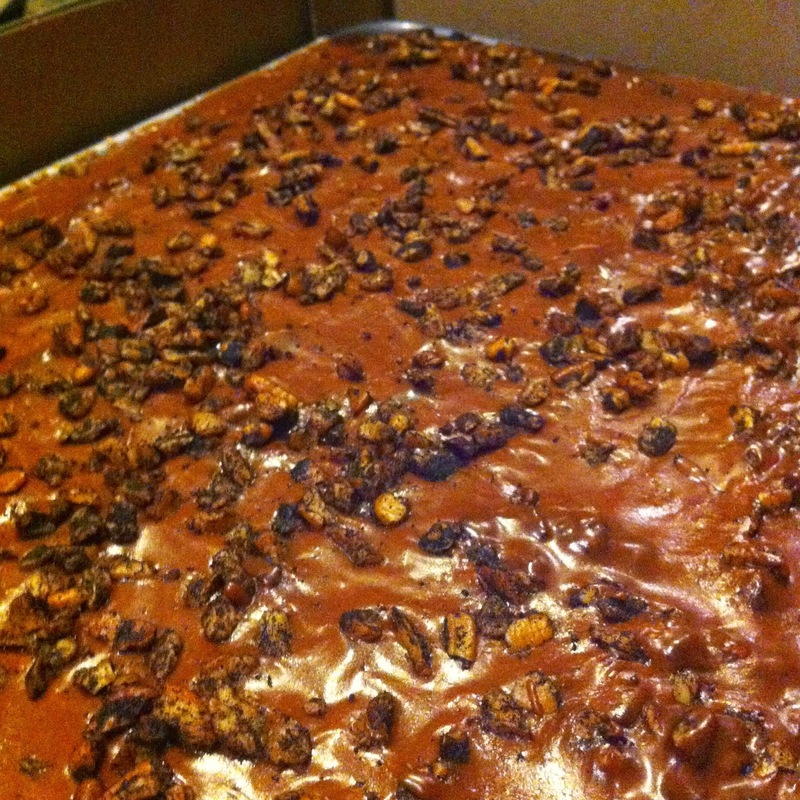 I have to try the coffee flavored pecans on my Texas Sheet Cake! thanks for the review! The coffee pecans from Amelia's Spicing Pecans are also great on pimento cheese. Yes, on pimento cheese. I make appetizers for a friendship group meeting using really fresh celery, stuffed with pimento cheese and topped with spicing pecans. Amazing and gobbled up in no time. The Texas Sheet Cake sounds amazing! In fact it all looks and sounds wonderful! This chocolate sheet cake is AMAZING. The added Amelia's Coffee Spicing Pecans creates a real kick. Also, this cake will stay fresh for a week!